Part of my role as mayor is meeting interesting people. One such person is Dan Mayland who has lived in the old Williams house (one of the oldest houses in Lansdale) on White’s Road since 2000 with his wife, Corinne and two children. I recently discovered that Dan is a published author whose book, The Colonel’s Mistake, reached the number one spot on Amazon.com’s spy-thriller genre in September 2012 in the U.S. Even more impressive is that three months later it made it to number one in Germany and Britain. In addition, his second book, The Leveling, came out this month. As someone who enjoys reading and has taken a few unsuccessful stabs at writing himself, I was impressed by this accomplishment. And like a news reporter who likes to showcase local talent, I felt obliged to introduce Dan and his book to Lansdale. His books take place in a little known area of the world which include the countries Azerbaijan, Turkmenistan and Iran. What I learned after reading these two books is that this region, which is rich in natural gas and other resources, is a hotbed for major players such China, Russia and Iran to exert their influence over these commodities that power our cars and heat our homes. Of course, there is also the role played by the United States’ interesting and complicated relationship with each of them. Dan Mayland skillfully integrates these issues while making the story relevant through its characters and story line. In order to make his stories believable, Dan has traveled extensively throughout the region as well as having performed exhaustive research on the cultures, history and background of the countries and organizations involved in his books– almost like a modern day Lawrence of Arabia. I think many of us are fascinated by someone who makes his or her living through art in one way or another. Writing well is an art form as is hitting a 95 mile per hour fast ball as is playing Rachmaninoff’s Third piano concerto. It is through these art forms that communities, nations and civilizations are measured and evaluated. And while no less important, many of us in Lansdale and the region work in utilitarian positions at Merck, Univest, Szekely Chiropractic, SEPTA or Molly Maguires. Fortunately for us, it is through the craft of those artists that we are able to escape our daily routines for a few hours in a book, at a baseball park or at a concert. Therefore, I invite you to take a look at Dan Mayland’s website, http://www.danmayland.com/, and if you’re into spy-thrillers try The Colonel’s Mistake or The Leveling knowing that it was written by a Lansdale resident about a world away. 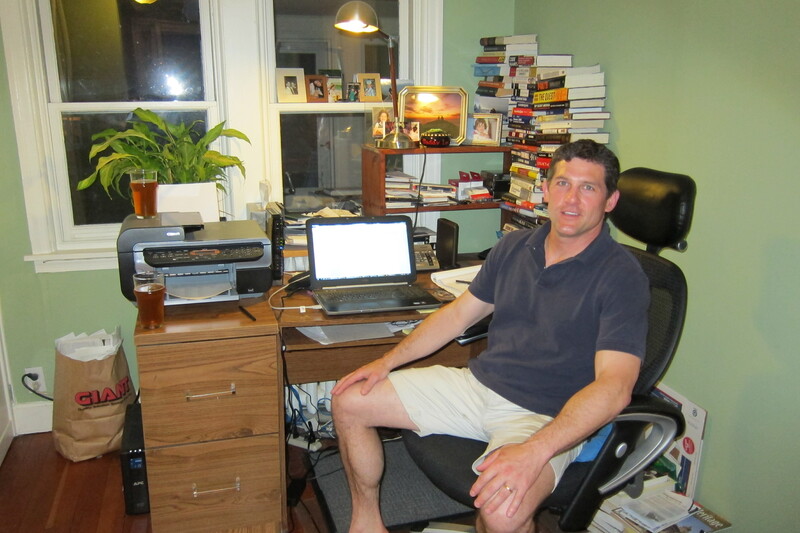 Dan Mayland at his desk at his home on White’s Road in Lansdale. The Lansdale Farmers’ Market began in 2009 providing residents and visitors alike with with fresh fruits, vegetables and other items as well as a community gathering place. First Fridays began under the North Penn Community Network in 2009 and then was taken over by Discover Lansdale in 2011. This event provides a nice surge of people into downtown once a month. Lansdale’s first ever Oktoberfest began in 2009 raising over $15,000 for the Lansdale Library. The hugely successful Lansdale Craft Beer Festival began in 2010 raising over $45,000 for local charities. Molly Maguires Saint Paddy’s Day One Miler benefiting Manna on Main Street. Founders’ Day began in 2011. Molly Maguires Irish Pub and Restaurant opened their second location in Lansdale in 2010 after they helped revitalize Phoenixville in 2005. Montella’s Sports Bar opened in 2010 after a full renovation of the historic Sir Philip Fox Hotel. Virago Bakery opened in 2010 ushering in Lansdale’s first all natural, gluten free and vegan bakery. Water: Elemental Arts and Crafts opened in the Dresher Arcade in 2011 marking Lansdale’s first quality art gallery. Round Guys Brewery, Lansdale’s first and only brewery, opened in 2012. Tabora Cafe opened their second location next to Railroad Plaza welcoming SEPTA passengers in 2012. Shell Fish Sue, Lansdale’s first seafood restaurant, opened in 2012. The common thread through all these new events and businesses opening in Lansdale is that they are all the result of GRASSROOTS ingenuity and small business toil which have made a REAL and TANGIBLE improvement in Lansdale. 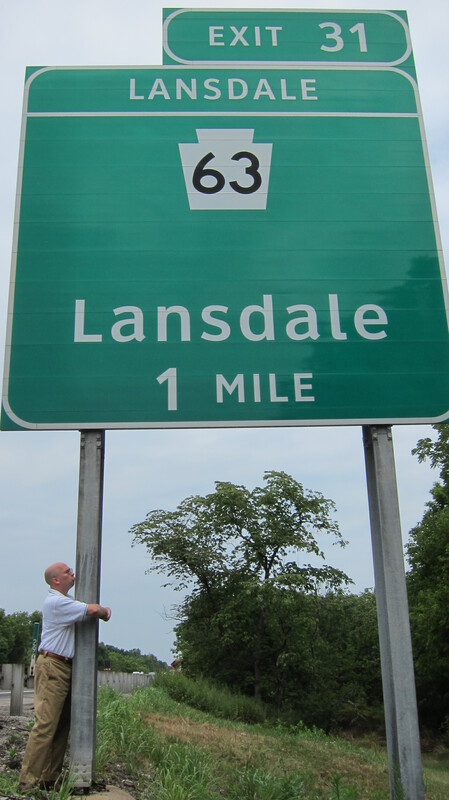 This is what residents and visitors refer to when they say Lansdale is turning a corner or that Lansdale is the next Phoenixville or Ambler. Unfortunately, some members of Council, our Administration and members of the Economic Development Committee have instead embraced a centralized, top-down approach that has included a hurried hiring of a business consultant, Delta Development, for $40,000. Mr. Dunigan, Mr. Strahm and Ms. Fuller all said that not hiring this consultant would “hold up” development in Lansdale or result in “analysis paralysis”. In fact, this consultant has arranged only one or two meetings in the past year with the result of NO new businesses in town and NO reports to the Economic Development Committee. Additional emphasis and money has been placed and spent on branding and wayfinding. Does anyone go to Ambler, Phoenixville or Doylestown because of their brand? No. The Administration also says we need to spend $4 million on the Borough Hall building because if “we don’t invest in ourselves, no one else will”. Does anyone go to Ambler, Phoenixville or Doylestown for their Borough Halls? No. Yet another example of a top-down, centralized approach that only expands bureaucracy. Lastly, the current administration and some Council members feel that if we hire enough consultants and spend another $4 million on the Arts Center it will be a success. With any successful arts venue, the demand always comes first from the arts organizations ORGANICALLY. Then as the arts organization gains the respect and trust of its patrons, a home is found. The Administration’s approach is backwards. As I have said in the past, the current discussion focuses on the building and not on the arts, where it should be for success. This is why I support Lansdale Borough Council candidates who also realize that Lansdale’s REAL success has not been from a centralized, top-down “spend our way” to revitalization, but rather a GRASSROOTS, COMMON SENSE approach that enables a true, long-lasting, sustainable rebirth to occur.